In the 1980s, Pearl Fryar and his wife went looking for a new home in Bishopville, S.C., and after being spurned by a neighborhood that feared an African American couple wouldn't keep up their yard, he set his sights on being the first black recipient of the local garden club's Yard of the Month award. Utilizing plants salvaged from the dump of the local garden center, Pearl began cajoling them into fantastic organic shapes, often working at night under spotlights until he had three acres of a walkable, three-dimensional garden work of art where, it has been said, "Dr. Seuss meets Salvador Dali". When he started, he didn't know what 'topiary' was, and had no training in either art or horticulture, which was all to the good. Bishopton has taken him to its heart now, his sculptures line Main Street, and you can ask anybody in town where the topiary garden is. In the best tradition of art, his topiary work has gone viral, spreading through classes at the local college and mentoring of young people and other folks in town are now sculpting their own hedges. 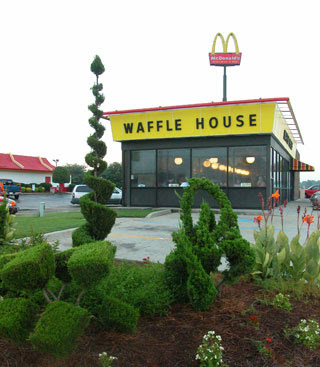 What must be the best-landscaped Waffle House in the country has granted the Fryars free meals for life in exchange for his wizardry in their streetscape. The “Pearl Special” is one scrambled egg, grits, and toast. There is now a book and a DVD about Pearl Fryar's topiary art (and a NYT article), and he has installations at the Phillip Simmons garden in Charleston (Simmons is another outsider artist worthy of your attention, a blacksmith whose work is now being preserved), and the South Carolina State Museum has accessioned mature works, transplanted from his garden, into their permanent collection. Pearl's home garden has been designated a Preservation Project of the Garden Conservancy. Much more information at the south carolina tourism site, and an account of a personal visit to Fryar's garden here. According to Pearl's official website "All are welcome and if you find me at home, I’ll stop whatever I am doing to visit with you and tell you about my work and why I create topiary sculpture." If you go, you'll be in good company; Rosemary Verey visited Mr. Fryar at home twice, but she died in 2001 before he could accept her invitation to walk the royal grounds with Prince Charles. What a garden meeting that would have been! What a strong motivator the desire to be accepted is. Pearl Fryar did it in a most positve and creative way that is an inspiration to all. My gosh, what a talent! These are spectacular. Wow. That's incredible stuff. And I love the background story. I suspect he changed a few minds--and lives, too, it seems. 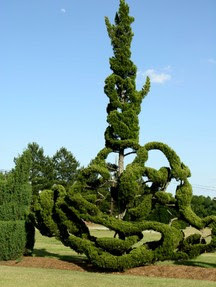 Topiary has never been my cup of tea, but confidence in the face of opposition I'll enjoy anytime. For me it's like country music - I don't always like the songs, but the characters that sing them are gold. That's such a wonderful, heartwarming story. His topiary is the most amazing thing I've ever seen. Nothing is cooler than that! ZOUNDS! WHAT A WEBSITE! And what a fantastic article. Delighted to have found you. Great story and pics Arcady. 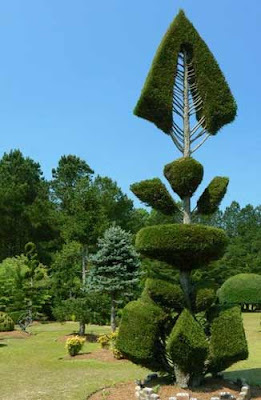 While topiary's not my "thing" I can certainly appreciate the effort that goes into them and these are truly wonderful. Definitely a garden to see before I die. I'd seen the HGTV special last spring, and was won over as a fan of Pearl Fryar and his amazing works of art. Very nice post! great post! I just saw the movie, Pearl last night and was inspired to post a blurb on my blog as well, but great job and great photos. I adore the Pearl thumbprint on the Waffle House's property, it doesn't get any sweeter than that! 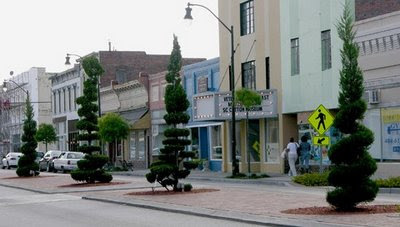 Now, I have to add Bishopville, SC to my list of places to visit! I had the opportunity to talk for about a half hour with Pearl while I was passing through Bishopville. His art is amazing, but the man is what makes the trip worthwhile. I have only met one genuine sage in my life - Pearl Fryar.